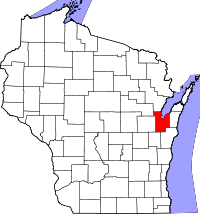 Brown County, one of two original 1818 state counties, used to encompass the eastern half of the state. Brown has some of the earliest vital records: births since 1814, marriages since 1823, and deaths since 1834. There is a statewide microfiche index of these records online, with the records at the Wisconsin Historical Society. Statewide registration, mandated in 1907, resulted in complete recordkeeping with records available from the Office of Vital Records at the Wisconsin Department of Health in Madison or locally at the Green Bay Register of Deeds (divorces from the Clerk of Court). Uncertified copies can be ordered by mail, fax, or in person for $20.